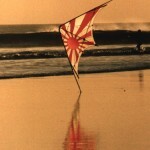 Here is the second in my series of articles featuring kitemakers from around the world. In the coming months, I intend to look at as wide a variety of kitemakers as possible, not wanting to concentrate only on professional makers or those already well-known, but hoping to introduce some new, different or unknown kitemakers as well. 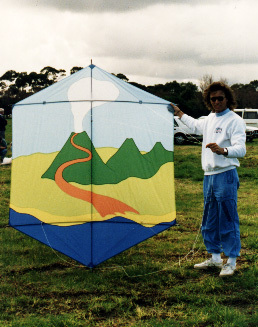 These articles are designed to give you some insight into the people behind the kite, what drives them and how they may be reflected in their kite making. This month features Neil Taylor from Perth, Western Australia. 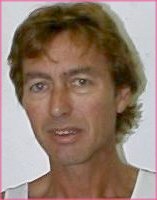 Neil is well-known in Australia and South-East Asia and is a very hard worker at any kite festival he attends as well as being one the nicest guys you would ever care to meet. 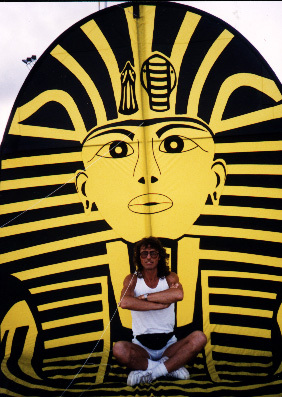 He makes a full size stunt kite called the West Coast Angel. 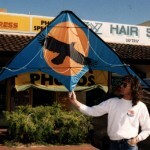 Neil’s commitment to quality workmanship in his products is self evident on inspection of his kites. Sit back and enjoy reading and finding out more about Neil and his kites. Music: Almost all music except Country and Western !! I couldn’t live without music! Neil with his latest toy and his shop in the background. Left home at 16, moved to Cornwall for a couple of years. Left UK in 1973 for Australia, best thing I ever did! Lived in Melbourne for 15 years. 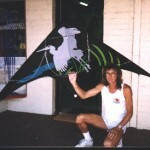 Moved to Perth in 1989 to open a kite shop. Worked as Trainee Farm Manager (farm labourer!!! ), Building Labourer (for 2 weeks, then promoted to Chainman then to Site Engineer (Surveyor), Council Gardener, Used Car Salesman, New Car Salesman, Council Tree Lopper, Mobile Crane Operator (for 10 years, promoted to) Operations Manager, Kitemaker. Basically, Jack-of-all-trades, master of none! Spent a year travelling overland from Australia to U.K. in the 70’s and spent all my holidays since then in South-East Asia. They want the things we have yet we have lost the things that they still have. What is the silliest thing you have done? Jumping out of a perfectly good aircraft! What is the most dangerous thing? Jumping out of a perfectly good aircraft! 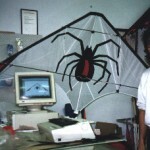 How did you get into making kites? I went out and bought a plastic stunter, wrecked it — bought another, wrecked it, too, then bought a ripstop one. I was off work for several months with a leg operation, borrowed a sewing machine and made a stack of seven simple stunters. They dragged me down the field on my face when I was still using a walking stick! Bought a Hawaiian, met Tony Wolfenden on the field one day and flew pairs with him regularly. Tony is one of the world’s gentlemen. Funnily enough, Tony and I were the only fliers in a fast-growing local group to take up making single liners. 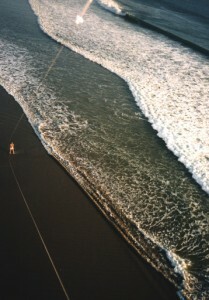 My first attempt at a serious single-line kite won me a free trip for two to Malaysia. This was better odds than the lottery!! I made several more kites to take to Malaysia with me where I met Shakib Gunn from Singapore and Michael Alvares from Perth. Shakib now spends 3 months a year here in Perth and is a constant source of amusement and a mine of information. 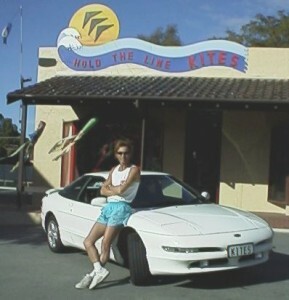 Five weeks after returning from Malaysia I quit my job of 12 years, sold up everything and moved 2,500 miles to Perth, Western Australia to open a kite shop. 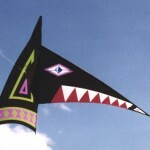 What type of kites do you make? What is your specialty? Anything that takes my fancy. I don’t really have a preference. I’m split 50/50 between single-liners and dual-liners. 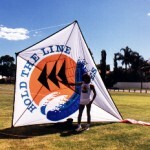 I make my living from selling dual line kites but I guess my heart is really in single line kites. 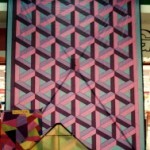 Do you make kites for a living? If so, where are they available? Firstly, it’s a hobby, I’ll never stop. I am lucky enough to have made a living from my hobby for 9 years now. It’s not easy; I’ll never be a millionaire but it beats a real job! I’m lucky in not having a family to feed. I sell from my shop, by mail, phone, fax or via my web site. What type of materials do you use? 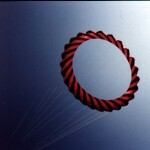 Mostly Carrington K42 but also Bainbridge 1.5 ounce for some bigger kites and for beginners’ stunters. Bainbridge ¾ ounce Dragon Cloth for tube tails and occasionally big kites (it’s cheaper!!). 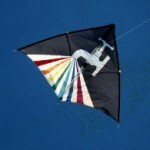 I use some clothing grade nylon for flat tails on single line kites because I like the way it flows in the air. I can also squash it into bags instead of having to roll it!! 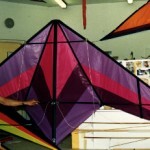 For spars I use mostly Pultrex 5.5mm for stunters and all sizes of Glasforms spars for other kites. I have a Bernina 217N Industrial which has been very reliable, Engel hot guns ( are there any others? ), a hot tacker (priceless! ), Loctite 401 but you gotta be quick! What construction techniques do you use? I use the old fashioned method, seamstick (double-sided tape) to join straight pieces as I like it’s strength and ability to stop any loose stitches from running and hot tacking for curves. I also double fold most seams in my commercial stunters for strength and neatness. I almost always use triple-stop zig-zag. It’s strong and my customers like the appearance of it. Do you have any construction tips for readers? 1 Always spend more time in planning than you planned! The construction time will be much shorter if you have already gone through the problems in your head earlier. Sitting on the toilet is a good time for this….no distractions! 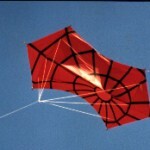 2 Plan your kites so that they can be assembled as quickly as possible……they get flown more often this way! 3 Never talk to people while you work….guaranteed way to stuff it up! 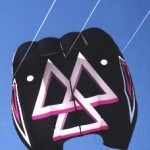 4 Always give your kites a name….they fly better. 5 Don’t lay any pieces of the sail on your lighted cigarette on the ashtray……it’s hard to remove the stain! 6 A fine-tipped black felt-tipped pen is very handy for replacing dropped stitches! What is the average time spent making a kite? Haha!! ummmmm……..How High is a Chinaman???? Which was the most rewarding kite to make? mmmmm……..probably “King Tut” . It was always the most popular kite with the people in the street and, after all, they are the ones I want to please as opposed to impressing other kitemakers. You might see one on the moon but it’s not very likely! Probably anywhere in Western Australia and elsewhere but I don’t think I’ve ever met anyone “of note”!! 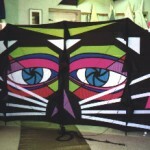 What are your philosophies on kite making? What are your inspirations? Long words for this kitemaker!! I’m not very philosophical or spiritual when it comes to kites or anything for that matter. I’m more, sort of logical………I like, therefore I make! 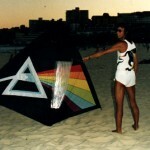 If my kites are enjoyed by other people then that’s a bonus. I’m actually quite shy in large groups of people but, at a distance, I like to entertain a crowd if I can. 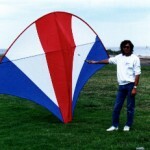 My biggest personal problem with my kites is that I never like them as much as I like other people’s kites. It’s very frustrating but I’d rather be that way…..makes me try harder next time. I’m no artist, I have to work hard to get something to look good, lots of trial and error. You might notice Neil likes the Pink Floyd design. 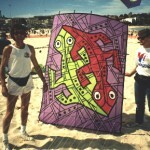 What/who has had the most influence on you in kite making? Without any doubt whatsoever, Peter Lynn. He takes the engineer’s approach first and then the artistic approach. He has more knowledge in his hip pocket than I could learn in a lifetime. Apart from that, he’s a bloody good mate. 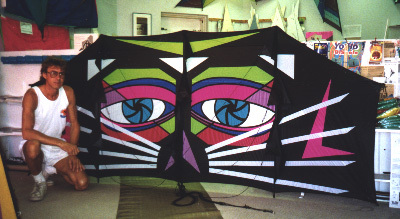 M.C.Escher for his eye-stopping graphics, Tony Wolfenden for his brilliant artistic ability, Ray Wilmer for his superb fresh ideas and little bits of just about every kitemaker I have ever met. I feel embarrassed with my kites at every festival I attend. 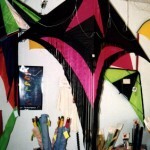 Have you run kitemaking workshops? Once, 9 years ago for kids. Never did it again! 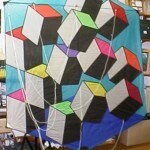 What is your favorite kite … that you have made? Who is your favorite kite personality? Mmmmm……that’s a tough one…….but I’d still say Peter Lynn first. He has so many sides to his personality…..there’s a lot there behind that smirk! 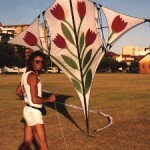 He’s a tireless entertainer and that’s something I empathise with in the kite world. Also, George Peters who entertains in his special way. Who else do you know who flies a minimum of a dozen kites at a time yet looks so relaxed. Not to mention the ground display! 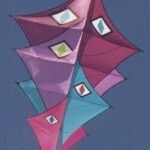 Which is your favorite kite festival? Bondi Beach, Sydney. It has one of the best locations for a festival, a natural amphitheatre, pity about the erratic winds! It has sun, surf and a good pub, what more could a kiteflier ask for! It is extremely well organised and has low-key competitions so they don’t take over from the fun feel of the festival. There’s a great feeling of cameraderie there. I wish more overseas fliers would go there as part of their holidays, they would have a ball! Where is your favorite flying site? The top of Mt. Batur volcano in Bali is pretty cool! Not much space for your feet! 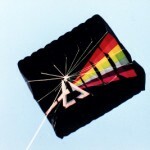 What is your favorite kite. Made by someone else? I have a 45 ft Peter Lynn Centipede, it lives in the sky! OK, so it’s sky junk, don’t be so picky! 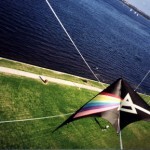 What kite flying experience is your most memorable? A 5 year old girl being lifted 40 ft in the air on the line of my 120 sq. ft. parafoil. It scared the hell out of me. Once in a lifetime is once too many. 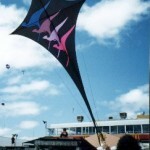 If you were going to a festival for your own pleasure, what kites would you pack in your kite bag? Yes!!!! I didn’t get to tell you how buggying is my really, really favourite pastime!! I also get much pleasure from aerial photography, usually with one 8 ft stunter and an automatic camera. 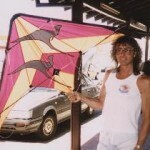 Thanks Neil for sharing some of your personal life and your kites with us! 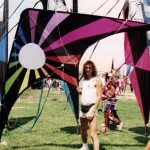 Readers wishing to find out more about Neil Taylor and his kites should contact him directly. 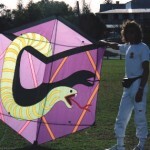 But before we go I still have a few pictures of Neil’s stunt kites to share .. This entry was posted in 1998, Issue 4 (Jul), KL Archive and tagged Australia, kitebuilding, kitemaker.